Hi Tech Security are Certified Security Installers of Aiphone, HID, Keyscan and Linear Access Control Systems. We specialize in the Custom Installations of Access Control Systems. We also install and service Access Control Systems for both Commercial & Residential Customers in Miami-Dade, Broward and Palm Beach Counties. Access Control Systems focus on securing and protecting access to doors, by using Electromagnetic Door Locks called MAG Locks & Door Strikes. These Door Locks are controlled by using PIN Code, Proximity Card and Biometric Readers (Finger Print Readers). Depending on the importance of protecting and restricting unauthorized personnel from these secured areas, depends on if you would like to have what is called a “Stand-Alone” or a “Server” Based (Networkable) Access Control System. A “Stand-Alone” System works well in small applications with one or two doors at a specific location, where the customer can add, edit and delete PIN Codes, Proximity Cards and Finger Print Access directly at each reader. Now, a “Server Based” System allows you to add, edit, delete and run detailed user logs (Time & Attendance) from the software installed on the server from any computer connected on the Network and Now Via the Internet! This allows the customer complete access and manipulation to their system via the server all at once instantly and efficiently without even being at the secured area. Also, you can control up to 256 Doors at one specific time. Utilizing the correct Access Control System is both very important and crucial in securing either your business or home! Our company fully customizes an Access Control System to allow the Customer to be able to have Full System Integration with CCTV Security Camera Systems, Intercom Systems, Video Door Phone Systems, Telephone Systems and Fire Alarm Systems. For Basic Access Control Security and Protection, Pin Code / Proximity Card Readers work great. They give the customer the option of either or both giving out Pin Codes for accessing a door or going with specific proximity cards. 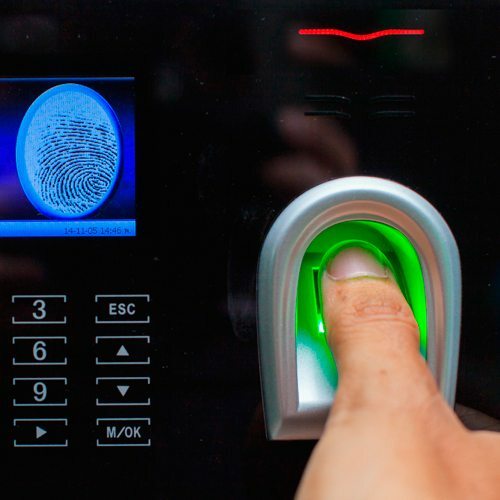 For the ultimate in Access Control Security with the highest level of security protection to any door, going with Biometric (Finger Print) Readers is ALWAYS Highly Recommended! A Stand Alone System is recommended for basic systems with only a few doors. This feature saves and stores all Pin Code and Proximity Card Information on each reader only. While, a Server Based System is for a more sophisticated system that gives the customer the ability to ADD, EDIT and DELETE User’s and User Information (such as User Name’s, User Pin Code’s and User Proximity Cards) at will from a Server Based Software Program. Any Professional Grade Access Control System must have either, if not both a Request To Exit Button and a Motion Activated Motion Sensor that will automatically release any MAG LOCK or Door Stike installed on a any specific door. Make sure the Security Company that is installing your Access Control System is both State Licensed and Insured! Yes, Hi Tech Security is State Licensed and Insured in the State of Florida and is a Certified Low Voltage Electrical Contractor.